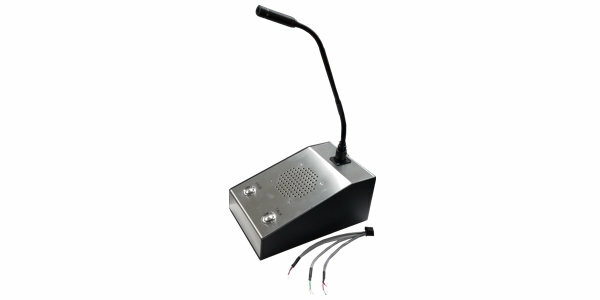 The DODC-1 includes a powder coated metal base with a stainless steel Faceplate, gooseneck condenser Microphone, a 3” Speaker, and 2 Vandal Resistant Push Button Switches specifically designed for the Detention industry. With its pre-wired cord it is perfect for those locations where some user control is required. The Face is Laser Engraved to prevent wear and destruction of labeling. One button is a “Talk” (Push To Talk) and the other is “Page”. The PRO 47T is a wide-range condenser microphone with a cardioid (unidirectional) polar pattern. It was designed for high-quality sound reinforcement and other demanding sound pickup situations. Standing 12.40” above the mounting surface, its small-diameter alternating gooseneck design permits highly flexible positioning while maintaining a smooth, well-contoured appearance. The PRO 47T features a 9.8’ (3.0m) permanently- attached miniature cable with tinned bare lead wire connections. The microphone element is enclosed in a rugged housing with low-reflectance black finish.